Considered the greatest closer of all-time, it’s fitting that the first player ever elected to the National Baseball Hall of Fame unanimously was Mariano Rivera. 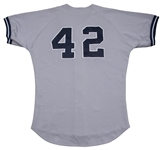 Rivera spent his entire career with the New York Yankees, where he amassed a Major League-high 652 saves and a 2.21 ERA. Rivera was the anchor of the great Yankees’ bullpens that won five World Series titles from 1996 to 2009. This historic , Likely one of a kind jersey is the only jersey we are aware of dating to his 1995 debut season! Rivera began his march to Cooperstown with his call-up in 1995 as a starter, going 5-3 in 10 starts. 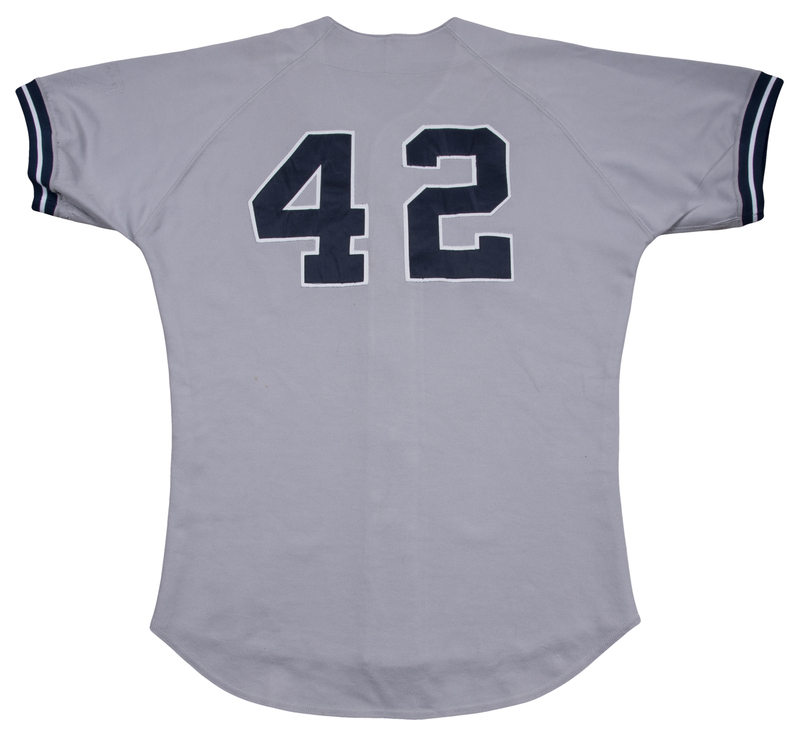 During that time Rivera wore this New York Yankees Russell Athletic size 46 button-down road gray jersey. 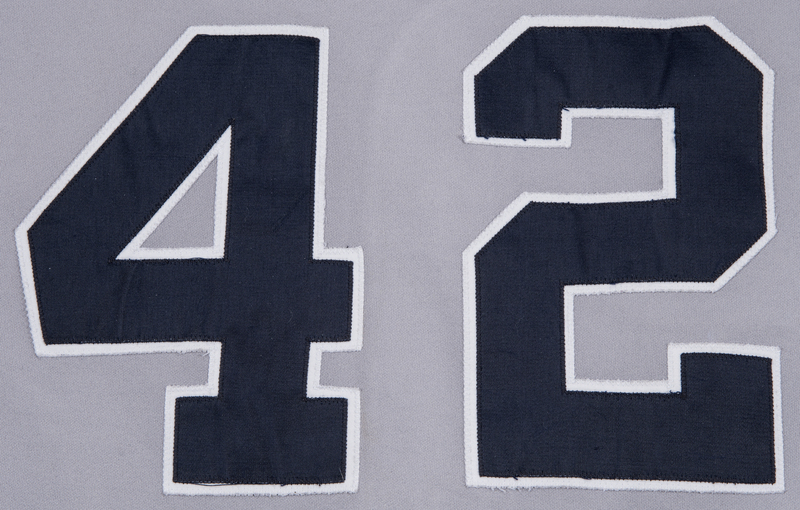 This jersey has “NEW YORK” in block letters sewn on across the chest in navy and white tackle twill. 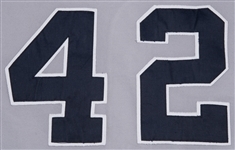 Rivera’s number “42” is sewn on the back in navy and white tackle twill. 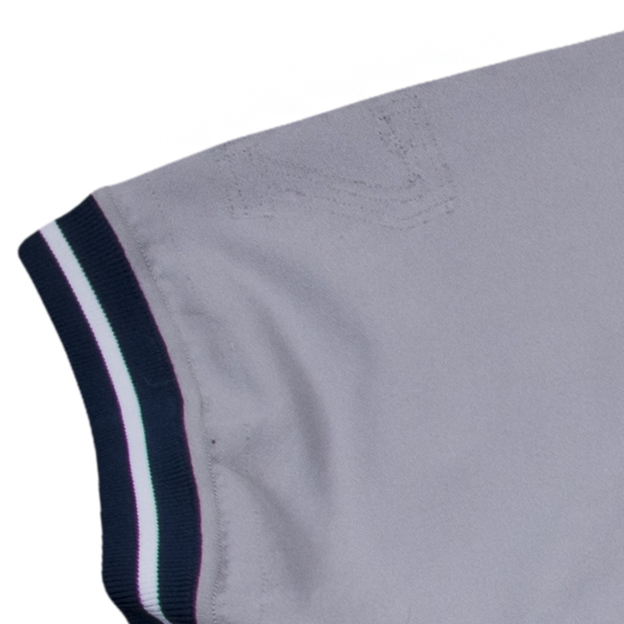 The sleeve ends have a banded knit navy/white/navy striping pattern and remnants of the number “7” and a black armband, worn on the 1995 jerseys in honor of Mickey Mantle following his passing on August 13, 1995, are apparent on the left sleeve. 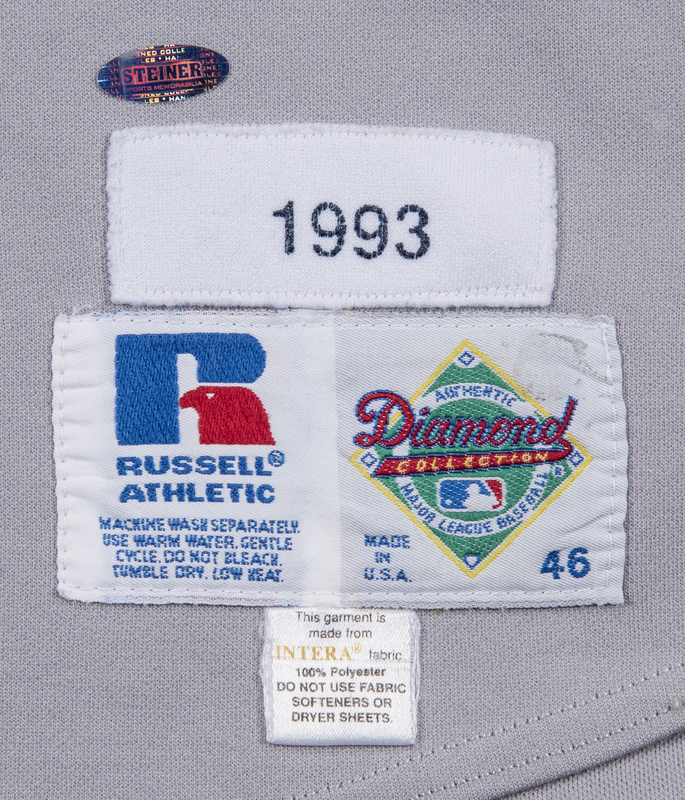 The jersey has the Russell Athletic size 46 tag and a 1993 patch sewn on the bottom front left tail. 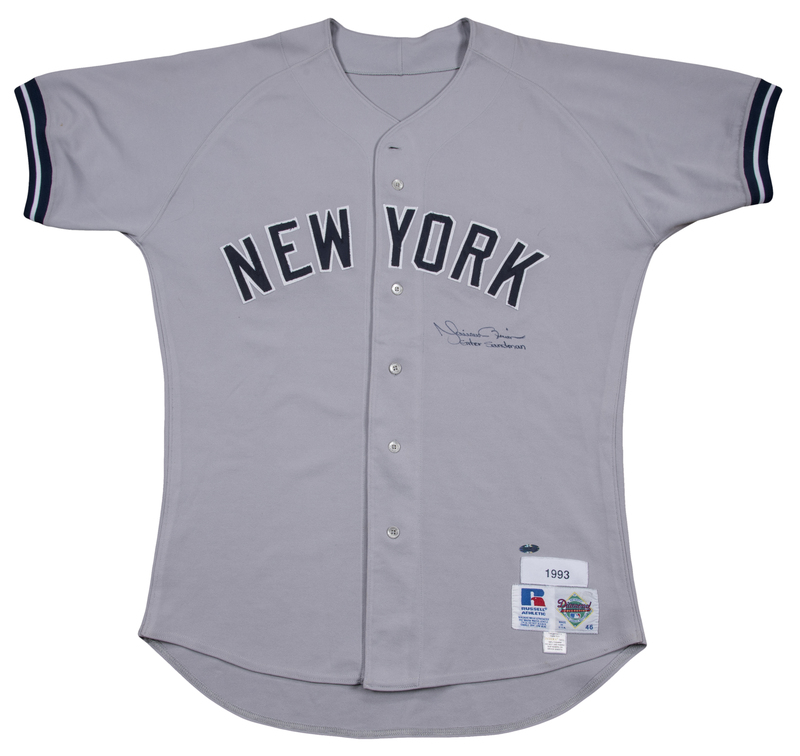 Adding to this already premium jersey is Rivera’s signature he added on the center left chest in navy ink with the inscription “Enter Sandman”. 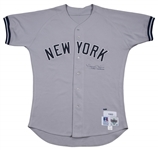 The jersey experts at MEARS determined that this jersey was “originally issued in 1993 to either John Habyan or Domingo Jean. 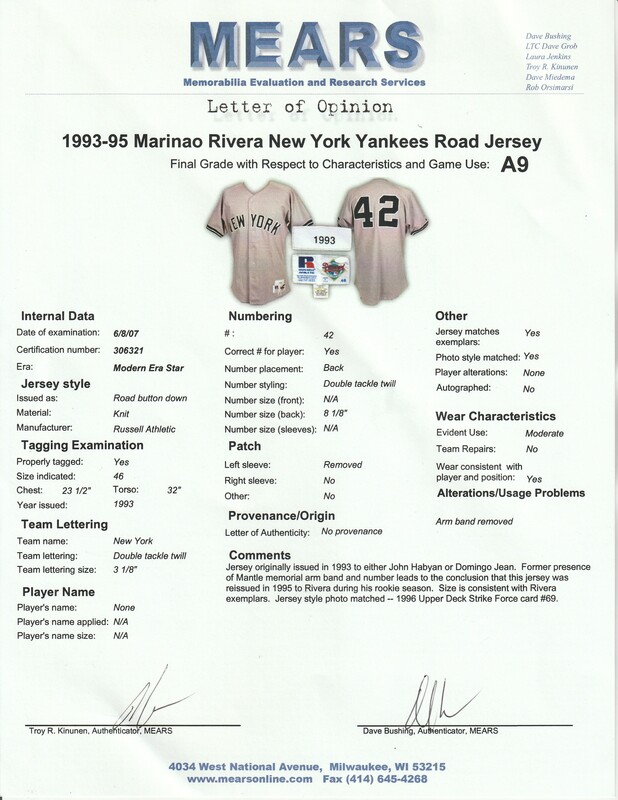 Former presence of Mantle memorial arm band and number leads to the conclusion that this jersey was reissued in 1995 to Rivera during his rookie season.” This jersey displays moderate game use. A tremendous opportunity to own what was likely the first Yankees’ jersey ever worn by the first-ever unanimous selection to the Hall of Fame. This jersey comes with a LOA from MEARS (306321), who have graded this jersey a near-perfect A9. 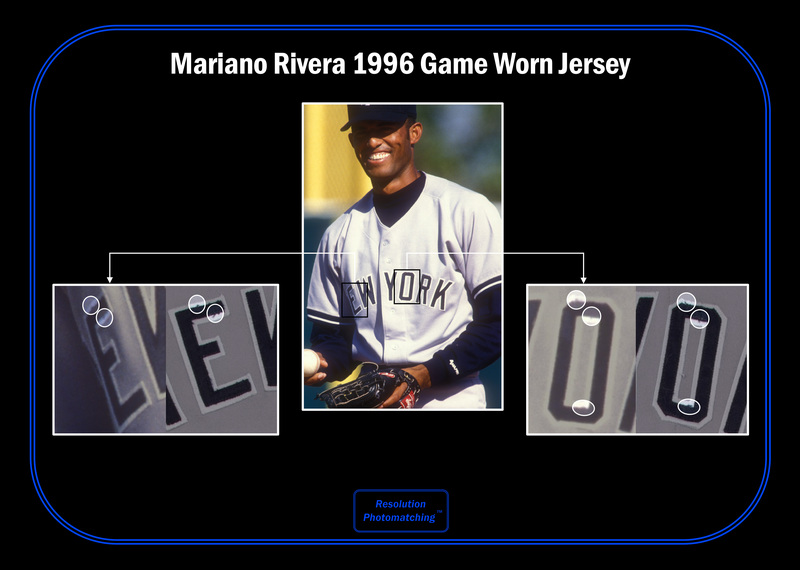 The jersey further is a match to a video clip of Rivera pitching in the 1995 ALDS. This clip can be seen on our website. 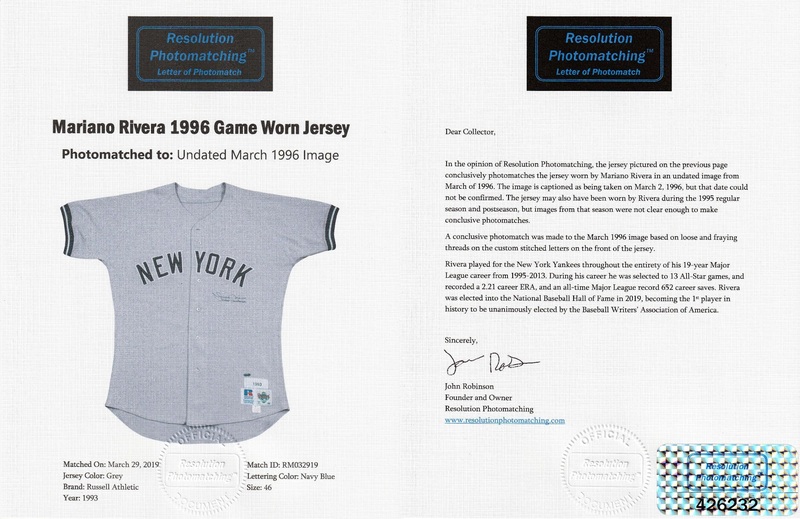 The jersey has been photo matched by Resolution Photomatching to the 1996 Spring Training, who have provided an LOA. There is a Steiner Sports hologram and a photograph of Rivera signing this jersey for his signature.